Remember the orders from mom, “When the street lights come on I want you home.” Or in our house it was the dreaded, “When the street lights come on its time to come in and get a bath and go to bed.” It wasn’t the bath part I hated so much as the bedtime. I always felt I was missing out on something going to bed that early. In the winter months it meant I was missing the latest episode of “Man from U.N.C.L.E.” in the summer, it was late night popcorn with its tempting aroma coming like incense up through the cold air vent at the corner of my bed. Street lights, which were so much a part of anyone’s life who spent time outside after dark, have gone the way of chimneys, rotary-dial phones hanging on the kitchen wall with cords long enough to reach to the farthest downstairs room and TV antennas that graced the roofs of every house in the neighborhood. The lights disappeared and we probably didn’t even notice because they are still here, just in a new package. Instead of the soft yellowish-brown glow of light that complimented even the most threating neighborhoods, now we have harsh almost daytime lighting. Every flaw is revealed and much of the daytime ugliness that we wished to block out is now spotlighted front and center. The new light is white, cold and cast hard edged shadows unlike the amber light which softened features and diffused the shadows of the big elm trees which stood on our terrace. The light sketched a pattern across the lawn picking out spots of light to illuminate in little circles following the patterns of the leaves. The shadows cast by the modern LED lights, whether street lights or car headlamps look more like ink stamps with defined edges with beginnings and endings. The old lights shadows faded away with no clear borders until the next one picked up the message and carried it on up the road. The amber light could change the color of your clothes. Maybe you went outside after supper with a red shirt on but when the street lights came on you were the kid with orange shirt. Or it was possible for your blue jeans to turn a mysterious shade of purple that you kind of liked but would never wear in the light of day. The old lights had bulbs. Big orbs that hung like tear drops from dainty skirts with fluted edges. Circling the elements was often a cloud of insects which danced in unison, sometimes kicking out one of the partners and then quickly letting them back in. Occasionally a Luna moth would appear in the crowd. It looked as out of place as a hawk joining a flock of sparrows. The moth would glide in and out of the amber, its green shade being converted to blue. On foggy or rain soaked nights each intersection looked as if someone set yellow cones under each light with the tips reaching up to the top of the poles. Cars and walkers would pass through the cones and then disappear as if by magic until they reappeared in the next pyramid of light. Street lights were something you played under, met your buddies by, stuck firecrackers in the cracks of the wood and nobody yelled at you and tacked yard sale signs and hand lettered lemonade signs to their splinted poles. Staples and thumb tacks from past events reached as high as the longest arm in the neighborhood. They were the neighborhood bulletin board and neighborhood watch combined into one constant you could count on. There were those times growing up in Nebraska and they were frequent during the summer storm season, when the life blood to the poles was cut. The neighborhood went black and the world became just a little scary. It’s like when you call your parents and all you get is a ringing and no answer when you know someone should be there. Your mind begins to wonder and you see all types of disasters and monsters lurking. But, when they answer the phone and the power comes back on, you realize how much you missed them. Many nights we sat out on the curb under the glow of the corner’s lamp. We solved the world’s problems or tried to figure out what might happen on the next episode of “Dark Shadows” all the while doodling in the sand left over from winter street maintenance. There were usually a few bikes belonging to kids from other corners thrown on the lawn or maybe someone joined the conversation late and decided the bicycle saddle was more conformable as they sat above us rocking back and forth on the asphalt. One by one the caucus would get smaller as one more reported for soap, suds and tub. When winter came the snow was blown as a soft blanket wrapping around the base of the pole. The light from the corner beacon took on a new life. Reflecting off ever surface, shadows were eliminated and the neighborhood was painted in pale ochre. The colored light snuck around corners like a cautious cat softly stepping towards it target. From the blending of the color of light from the street lamps and the falling snow the sky over the town turned purple giving your eyes a new palate of colors to explore. Today’s white light seems to make the winter nights just a little bit colder. The invitation isn’t there to venture out for an illuminated walk following tire tracks in the fresh snow like it was with the warm yellow glow. The old lights came on slow like the night did when you were waiting for the lightning bugs to start flashing. The filament in the bulb would begin to glow and you knew the hours of play were being counted down. Slowly the light would invaded the approaching dark and games of catch or pick-up ball games were over and potentially more mischievous activities began to take their place. Today’s lights flash on resembling Dad’s old flash bulbs on his camera catching us all off guard. And, they go off just as quick with no warning. Wouldn’t it be a terrible thing if sunrise and sunset was an instantaneous event? There are many things of the night that are still the same. Fireflies have not gone LED yet and evening campfires will still light up the backyard with a glow that attracts kids and adults like the moths around the street lamps. As a personal protest to the changing color of light, I keep amber lights on the porch which paints our house and yard as far as the light will stretch with memories of nights and colors of days behind us. I guess, seeing things in a different light, is all part of growing up. It has been months since I have been able to publish a new memory. Family illness and deaths have taken a front seat to writing. This is all behind us now. I hope this new story starts us on the road back. I remember when no one worked on Sunday. I am not even sure you could tune into news and weather on a Sunday morning. I know you couldn’t go shopping because the stores were closed and that included grocery stores. You were out of luck if you didn’t plan ahead for bread and milk. Wal-Marts were nowhere to be found and I only remember one filling station out on the highway that was open and they only sold gas; not coffee, hot dogs or beer. Sundays for the Casey family always started with all of us taking our assigned seats in “Black Beauty” and Dad chauffeuring us on the pre-dawn drive up the hill for Mass. Mass started at 6:15AM and for some reason the folks always picked the earliest Mass of the day. This had to present a challenge with two small kids in the house. As an adult, thinking back, I know Teresa and I probably needed help getting dressed and ready for at least a couple of years. How did they coordinate all of us out the door at the same time? Plus, like many families then, there was only one bathroom in the house. Somebody had to give something up. After Mass, it was straight home for a family breakfast. Sunday was the only day I remember sitting down as a family for breakfast. Every other morning it was getting ready for school which often meant different seating times for everyone. But, on Sunday mornings the sound of frying bacon mimicked the shushing cottonwoods down by the river on an August afternoon and pork cologne floated through every room in the house like the incense from morning Mass. I think bacon is one of the only foods that sounds as good as it smells when being prepared. Dad was always on toast duty. “Who wants their toast buttered?” was his battle cry. I always thought that was a big deal, having your toast buttered when you sat down. Imagine my disappointment in college when they served up dry toast in the breakfast line. After breakfast we would all lounge around the house. Maybe take a nap, read the funnies in the Omaha World Herald, or wait for the Protestant kids to get home from church and meet us outside to finish an Army battle we started on Saturday. If it was a cold and wet Sunday, my goal was securing my favorite spot on top of the warm air register in the “playroom” and reading copies of the “The Boy Mechanic” borrowed from the library. It was in this magazine you could learn to make a crossbow from the leaf spring of a car, fashion a lawn mower blade in to a cool knife or make a box kite that would fly better than the kid next door. Today, this magazine, and all of us who checked it out are probably on some terror watch list at the NSA. Rides in late September and October were the best. To prepare for the adventure, Mom would roll back the edges of brown grocery bags and crease them as neatly as she made the cuffs of our jeans. Then she would fill each bag with delicious, white as first snow, popcorn freshly popped in the seasoned aluminum pot with the glass lid. A polished johnathan or delicious apple with its four distinctive bumps on the bottom and loaded with juice that would leak through your fingers and down your wrist and snapped when bitten, were set aside for each of the passengers. Sometimes popcorn was replaced with peanut butter and butter sandwiches; two slices of bread, peanut butter on one side, plain butter on the other, the bread cut in half and tucked into wax paper wrapping with ends folded in triangles over perfect half inch seams. Or, if you wanted a real gourmet sandwich, you requested potato chips in the middle as an added bonus. In the fall the favorite ride destination was the Barada Hills to view the fall color canvas and check out some of the local apple orchards. The Barada Hills were nothing more than the bluffs of the Missouri river, the remains of the banks of a mighty force that cut through the drain of the Midwest during the melting Ice Age. For most of us, these bluffs were the closest relatives to mountains we would ever see. West of these bluffs, Nebraska leveled out like a kitchen table top with nothing between the bluffs and the Rockies except a few salt and pepper cottonwoods and willows to slow the wind down. The hills provided the fall foliage similar to what people living along the east coast would brag about in letters back to their flatland relatives. The gentle valleys and hills of the bluffs looked like bowls of Tricks cereal spilling out over the landscape. And, if we were lucky enough to have an early fall snow, the white milk rivers filled the bowls. At some point, Dad would pull the car off the road into a turn off leading into a pasture, blocked a few car links ahead by a gate. I often noticed there were no paddocks on the gates. Most of the time they were secured with just a piece of wire looped over a locust post. I don’t know if the farmers trusted that the cattle would not figure the loop out or they had enough faith in people not to disturb their animals or land. Stopping was the signal for Mom to break out the popcorn or sandwiches. Those in the car not coffee drinkers would share a can of cream soda or root beer, the folks had coffee out of Dad’s old red and grey thermos with the ageing cork seal. The windows would all be rolled down and the last of the fall grasshoppers joined us looking for their last meal before winter snuck up on them. All of us would just sit there and admire the landscape in front of us and every once in a while catch a whiff of a leaf fire burning in some farm yard nearby. I know Dad was restless sitting there. He wanted to hike through the hills in hopes of finding the remains of a Mastodon even if it was just a petrified tooth. He always wanted one to add to his fossil collection. Some of our Sunday rides were nothing more than scouting trips for the next hiking area that he would take Teresa and I to. Many of the roads we traveled were still gravel or just hard packed dirt. On the dirt roads the car would leave trails behind like vapor trails of a jet. Rocks would kick up in the wheel wells sounding like bridge trolls knocking to get in. “I wonder what’s down that road?” Many times we would take a turn down a road that led us to unexplored Casey territory. More than once barn yard dogs chased us down or the road became too rough to risk the family car on such an exploration. When we would pull into home we would all get out stretching just like the shadows extending long across the back yard. Mom would be the first in the house and would open up the curtains and let the last bit of the Sunday light into the house. We were back to reality with school looming on the horizon of Monday and an early rise to work for Dad. But, we had added to our repertoire of places and roads never explored before by a Casey and in many cases, never again visited because every Sunday ride took us on a new adventure. I still have a habit of picking a road that might lead to a different way to work or home. Just the other day I turned off the “main drag” on to a road I pass daily. I had some time to kill and I just wanted to see where it would take me. I was treated to a path that bordered a spring busting from a few days of rain. There were mini-waterfalls all along the creek bed as it dropped levels trying to keep up with the downhill slope of the road. It wasn’t too far down the road when the path began to narrow. The smooth pavement I pulled onto became a rut filled road with each dip holding water that didn’t make it to the stream from the rains. The car tiptoed on the road like a proper lady holding her white dress up crossing a muddy road. It took longer than it should for my inner voice to say, “You shouldn’t be here and you better turn around.” But by then the road was bordered by thick stands of trees on one side, and a quick drop to the creek on the other. I had no choice but to pioneer forward. “The Road Not Taken,” as Mr. Frost referenced is not always a bad thing and for many of us, it is all part of growing up. Most people have a few irrational fears; black cats, scary movies or clowns. Some fears are normal; heights, the dark, water or fire, these are understandable phobias. I have a phobia that I am not proud of. It has caused, at times, my family stress and on other occasions some entertainment. The fear has prompted me to change my driving route more than once. It is a condition that I have never sought treatment for, but I am sure there is some psychiatrist out there that would enjoy analyzing me. When I am with others my secret fear is barely recognizable, but for me it is always front and center. It is a condition that can freeze me in one spot, not willing to move one more step forward. I have even read about people who share this same malady cancelling trips to exotic places because they may need to face this fear head on. The statistics on how many are cursed with this condition are questionable. Most of us don’t like to admit our weakness, so we stay quiet. We carry our phobia in secret hoping it never shows itself to others. We are the carriers of gephyrophobia, the fear of crossing bridges and overpasses. You might say to yourself that you don’t like to cross bridges either. That is a reasonable stance to take especially if you live in Pennsylvania as I do which has the distinction of having the highest number of structurally deficient bridges in the country. My fear goes farther than just not liking to cross a bridge, I don’t want to cross a bridge. The subtle difference between the two is that I will, in some cases, change my course of travel to avoid a particular bridge that you might just drive over with a little apprehension but continue on. My affliction came on me innocently. It started with a simple request by a cute, blonde buzz cut, green eyed little boy (me) asking Dad, with pleading in my voice, to allow me to step out of our car “Black Beauty” while the rest of the family drove over the wooden planked bridge that spanned the Big Muddy River northeast of town. If they all wanted to plunge nose first, riding the car all the way down with the glass naked lady hood ornament leading the way into the muck of a river below, that was their choice. I would be saved to run to the nearest farm house to get help or to carry on the Casey name after they all perished. You can imagine how that request went over with First Sergeant, Dad. To cross the evil bridge the driver first needed to line the tires up with the two wooden ramps that led up to the bridge. They angled up at a mean forty-five degrees. This was so that you could get to the bridge deck during high water. As we started our ascent, all that could be seen from a five year old vantage point in the back seat looking over the thick bench seat in front of was sky and rusty iron beams. Even a five year old knows rust means decay. “Don’t leave that toy outside, it will rust…dry the shovel good or it will rust and we’ll need to buy a new one.” Any second, Dad was going to trust the lives of his whole family to a bridge made of rust and rotting wood beams. When the car leveled out on the bridge, the front wheels of the heavy DeSoto slapped the oiled beams forcing them to pop up and down like running your finger the full length of a piano keyboard. Each rise and fall was bringing the car load of Caseys to certain death. Two generations, gone in the murky sands and mud of the Big Muddy River. The creak and groan of the timbers sounded like death tapping on the back window, “I’ll be waiting for you at the bottom” I heard him say. When we got to the other side and came down the ramp to the gravel base of the road, I took a quick peek back knowing that I was going to see the bridge collapse behind us in a slow motion bend and fall. Of course all of this was repeated on the return trip. It was probably at that point Mom and Dad gave up all hope of their number two son ever growing up to be a contributing member of society. The old bridge stood for many more years until it was finally cut off from traffic but it forever planted a seed of distrust in me for anything that spanned water. And then“The Willies Bridge” was added to my list of nemeses. “The Willies Bridge” spans the fastest moving river in the lower forty-eight states. The river cuts a menacing channel on a race to meet its sister, the Mississippi. Everything that fell into the river from its origins through the Dakotas and down the eastern border of Nebraska is just waiting to slice a car in half when it drops off the bridge into the steel grey water. The bridge was originally a one way toll bridge. A car would approach the bridge on a long climbing curve up to the main bridge deck. Again, another bridge built well above flood stage, (wouldn’t catch me on it during a flood anyway.) Once you hit the toll area the driver had a red or green light to signal a safe crossing. With the go signal the driver pulled up, paid the toll and went across the massive expansion of iron girders painted white and looking like a maze of spider webs suspending cars above the water. The other side of the bridge was the long flat bottom lands formed by the Missouri River. The ride across was almost a pleasant trip. You were higher than the rest of the countryside which gave you views up and down the river and a chance to share the beauty explorers Lewis and Clark must have experienced on their passage through this part of the country. Then, some politician decided to turn what was a one lane, somewhat safe bridge, into a two way free bridge. Black Beauty, with her full fenders and wide bumpers sucked up the full width of her allotted lane space. Crossing now meant facing oncoming traffic at highway speeds leaving very little room to spare. Coming at us on crossings were monsters such as tractor trailers whose tires stood taller than the average first grader, and ten row combines with their enormous claws ready to flip any car over the edge and into the river only to surface somewhere around St. Joseph, MO. To make the traverse even more interesting, a Burlington Northern coal train bound for Norfolk, VA might be charging east on the trestle next to the bridge, so close to your opposite side that you could feel the vibration of the railcars as they ticked the joints in the rails. But, the story of this bridge doesn’t end here. On our trips from Pennsylvania to Nebraska to visit the folks, the last leg of the journey was often at night. We would gas up in St. Joe and follow I-29 north to just outside Oregon, MO. Once off the interstate, we followed a lonely highway through Squaw Creek Wildlife refuge, dodging deer, fox and other assorted creatures that decided they owned the highway at night. The crossing that follows occurred on one of those nights. The headlights only worked a few feet in front of the car then they hit a wall as if someone was holding a white bed sheet over the road. The center line of the highway was swallowed up and the white line on the right was all but washed away from recent rains and flooding. I knew the bridge with its arching climb was somewhere looming ahead in the fog. As we got closer to the bridge my knuckles on the wheel were as white as the blanket that surrounded us. There was no hiding the tension that was building up in me from Tina and Adam. I probably didn’t instill confidence in either one of them by voicing my growing fear of the bridge. I was not being a good captain. Of course his comment didn’t inspire any calm in me. As we started up the ramp to the bridge I was all but crawling with the car. A child in a pedal car could have passed me, but I knew what was yet to come. My heart was beating out the rhythm of the “Jaws” theme in my ears. And then, there it was, looming out of the fog like the Death Star coming into view for Luke Skywalker. It reached its iron tentacles out to us like a Halloween skeleton beckoning us to come forward with an “I won’t hurt you” utterance. The tires hummed as they stepped off the blacktop onto the grate of the bridge deck. I slowed even more knowing that below me was the churning blackish water of the Missouri, beside me on both sides were paths to a death plunge off the bridge. And then, a faint light ahead. Two white eyes surrounded by fuzzy orange balls. They were getting closer. The lights grew brighter turning the entire scene into the white light those who have returned from the edge of death talk about. This is it, we’re going over the edge. The roar of the monster was from deep in its gut and its hot breath was felt through the open windows. When the tractor trailer passed a calm came over the car. There was no road noise, the fog lifted and no movement could be felt. No, I slowed the car down so much that we came to a stop. And, for just a fleeting second, I thought about getting out and walking the rest of the way across. “The Willies Bridge” was replaced several years ago. It ended up in the watery grave of the river which taunted it for so many years. A “safe” modern bridge now connects Missouri and Nebraska. The new bridge was completed ahead of schedule. That fact doesn’t instill any real confidence in me. What corners did they cut to satisfy a schedule? What bolt was not turned or which weld is was not finished? I think I will still take the alternate route if I ever travel that direction again. All part of growing up is…hanging on to some of the scars that were… all part of growing up. Have you ever felt like you were somehow transported to a different time zone? I remember watching episodes of “The Twilight Zone,” where characters would move from one time period to the next, sometimes with tragic consequences while other situations proved to be comical. Or, the movie, “Back to the Future.” I was right there with Marty McFly and Doc. These shows, peppered with a few comic book escapades always made me wonder if time travel was real. Well, it is. And, whether or not you want to admit it, like me, you have probably experienced a trip from one dimension to the next. Most of my time traveling log is filled with encounters with people who are time travelers themselves. Individuals so passionate about their pursuits that while in their presence one leaves the current calendar year and steps back, (rarely forward) to meet the traveler where they once existed. The journey back could be to the fifties and sixties teleported by a muscle car enthusiast who takes you for a ride in a period transforming car with all the trappings of the age of four barrel carburetors, racing stripes, eight ball shift knobs and a plastic Jesus mounted on the dashboard. It is easy to slip back to a period when worries of gas efficiency were none and the main concern was finding a filling station (remember, that was their name in this time zone) open after 9:00PM as you cruised the main drag with a coke in one hand and your girlfriend beside you. Time shift can occur sitting around with friends discussing music from a time when the best music rolled from a friend’s house who could afford the latest LPs or 45s. Through the magic of needle drops and turntables you could listen to the same song set over and over with no commercials. Eventually the album would be replaced by the next popular tracks, then taking its place in a growing library…that today is sold on E-Bay or yard sales when the folks sell the homestead. A time travel experience can be a train trip through mountains passes of Maryland, West Virginia and Pennsylvania shared with a cross section of humanity bound together only by a common direction of travel. As a nation we have been crossing the Rockies and swinging through the Deep South on trains since the golden spike was planted in 1869. Trains, unlike planes, stop in stations that have histories. Distinct from airports and Uber stops, train stations wear their past on their painted shut windows and weathered brick facades. The stations may have served our fathers traveling on troop trains or grandparents and great grandparents as they traveled from eastern ports to Midwest prairies in an effort to established roots in a new country. On a recent train trip from Washington DC to Connellsville, PA I experienced a time portal worm hole which slipped me out of one time zone and into another. The trip started in Union station with a hodge-podge band of sweaty west bound travelers. Women tugged at their blouses pulling them away from their skin while desperately trying to pump cool air in. Little kids with pop stained lips tugged at pant legs looking for some place to wipe off. When the gate attendant announced the boarding of the Capital Limited the crowd formed a human train wrapping from the gate to out and around the man in the middle of the concourse providing a “DC” shoe shine. There was no conversation among the passengers. Most were more concerned with looking down at the blue glow of their phones and kicking their bags forward every time the line moved an inch like drivers in rush hour traffic jams thinking an inch forward was an inch closer to home. At this point our only common purpose was staying cool, not losing our place in line and secretly picking out the person we hoped we did not have to sit next to. One of my picks was an urban cowboy in a black leather cowboy hat, a paisley print red western shirt a crumpled box of Marlboros in his pocket and the fragrance of day old cigarette smoke clouding around him like Charlie Brown’s buddy Pigpen. The runner up was a large man traveling in navy sweatpants and a too small red T-shirt. He must have decided this day was a good day not to wear underwear. Each time he adjusted his luggage or reached for one of the boys traveling with him, his oversized sweatpants dropped and the shirt hiked up to reveal an early moon rising. Fortunately, when we boarded both choices were sent to the front with the Chicago bound passengers, I was sent to the last car with the rest of the early drop offs. When we finally made it to the outside platform the train was waiting restlessly for all of us to board. Once on board you could feel power wanting to pull forward like a new puppy tugging at the end of a leash eager to explore new smells. The train spit occasional bursts of air similar to an impatient husband huffing, waiting on his wife to finish the last touch of makeup. Once down the rails the railcars begin to rock like a cradle being swayed gently coaxing sleep. It’s not long before the sandman visit the car and snores bounce off the walls. For me there is too much to see to settle for sleep. I want to see the countryside and experience as much of the trip as I can. Because of this I escape the rolling bedroom and spend most of my trip in the observation car. Passing time in the observation car I was rewarded with once-in-a-lifetime views. The train slithered through V cuts of cragged rocks. The fire toned sky was grounded by trees, with their tentacle silhouettes looking like they were drawn with an ink pen touched on wet paper. Each bend in the rails shared a different intensity of color that dripped orange, purple and blue through the car’s glass ceiling. Open seating in the observation car dictates that if a seat is available it is yours. Somewhere between Martinsburg, W.VA and Cumberland, MD, I was joined by an Amish family. Grandpa, his teenage son and his three year old grandson found seats directly across from my booth while Grandpa’s daughter, her husband and little baby Nancy snagged the empty seats across from me in my booth. Little Nancy was plopped on the table and quickly started smiling either with me or at me while I finished off a peanut butter sandwich, which I really think she was trying to charm out of me. Nancy’s hair was braided behind her ear and her bangs were knotted forming two little apostrophes on her forehead. Her black tunic draped over her spilled on the table behind her and in front, it fell between two chubby legs covered with black stockings up to her knees. The tunic covered a summer grass green blouse that popped out at the sleeves and collar; the color contrasted against her skin as white as the background of this text; an angel could not be purer. Mom and dad were not shy in getting a conversation started. We talked about their farming life, and their ultimate destination of Bismarck, SD. The whole family was riding the train from Baltimore, MD to Omaha, NE and then a van to Bismarck for chiropractic appointments. Even little Nancy was going to get her first adjustment and it pained me a little visualizing her being bent and twisted by the chiropractic arts. Eventually, the family was able to sit together and they politely took their leave of my booth and joined Grandpa and the two boys across the aisle. I know I mocked my sleeping comrades earlier but some things you just need to give in to. The swaying of the cars, the late evening after a long day of travel, finally forced me to surrendered to a cat nap. When I woke up time, travel happened. I was in a different era than when I nodded off. By some quirk of physics or wizardry transformation, I was no longer in the 2016. The sights and sounds around me launched me back a hundred years. The tunes of a harmonica reeling out “Jimmy Crack Corn” filled the train car. The first thing my groggy eyes capture is a family dressed in 19th century clothing, men with whiskers that would make ZZ Top jealous and little Nancy bouncing on the table looking like a turn of the century baby doll. There was nothing in my immediate view or hearing that indicated I was anywhere but on the “Last Train to Yuma,” just waiting for the robbers to stop us at the next junction. Time travel is real Marty McFly and you don’t need a DeLorean. When clearer thinking returned, I listened and tried to crop everything out of the picture except little Nancy moving in rhythm on the table to mom’s melodies and the rest of the family toe tapping and finger walking across the table to the joy of the moment. I didn’t want anything from the future to creep in and destroy the past. When we finally pulled into the Connellsville station, I was back to the future with a job the next day, grass to mow and phone calls to return. For several hours I was locked in an adventure that fuels today’s moments with memories and images no camera could capture or video explain and proof in my own mind that time travel is real. Living in more than one moment at a time is a gift given to all of us as…all part of growing up. We have all heard the stories of growing up in a small town. The closeness of neighbors, (sometimes too close,) the ease of getting around town, economy of living, friendly neighbors and general calmness are qualities of most small towns across America. Of course small is a relative term. 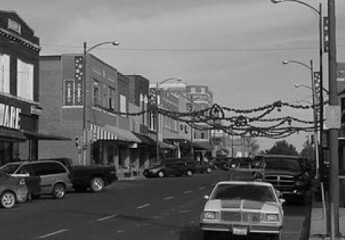 Our small town, Falls City, NE, was big compared to the surrounding communities. We were a flexible count of fifty-four hundred when I was growing, to down around forty-eight hundred at last count. Neighboring Rulo has a little over two hundred and Salem going the opposite direction up the Nemaha River is not much more but, to Straussville, where the population changes by the number of people living in the one house, Rulo and Salem seem like two bustling metropolises. something that is often overlooked in the tourist brochures and the Chamber of Commerce enticements are the sounds of small town life. The symphony of village living is often missed until we stop and listen. On many summer afternoons, away from freeway traffic and sirens, you can hear cicadas droning or cottonwood leaves rattling in a slow breeze sounding like bacon frying on a Sunday morning and the neighbor’s lawn sprinkler spitting darts of water phtt..phtt..phtt. Children playing outside are unaware of the base melody they contribute to the neighborhood chorus. Laughing, yelling across front lawns, or just being children they add a sound like tiny bells chattering back and forth with each other. When we played outside there was an added element that interrupted our song; our mothers whistles. Now I am not talking about our mothers puckering up and blowing a simple tune. Nothing that easy. The mothers in our neighborhood were too refined to stick their heads out the window and call their young’uns as if they were calling home a roaming dog. No, they had store bought whistles, each one a different tune, handpicked to be unique. I remember going with Mom to the Woolworth store and her testing different whistles to make sure she could get the volume necessary to call her charges home. There was no embarrassment on her part blowing it at full volume to make sure it would do the job. She finally settled on a flat three chambered blue and red whistle that for years after we grew up still maintained a spot in the “junk drawer.” Every grandchild had their turn at blowing it around the house but in the end, it always found a way back to the drawer. First, if you were a kid of any skill you could pretty well judge the time of day by the sun. You knew if the sun was casting long shadows out into the yard from the bird bath, garage and power pole at the ally, you knew it was about 7:30 or 8:00 in the morning. No shadows and you knew it was high noon and when the bird bath shadow tipped to a long eastward direction, it was about supper time and almost time for Dad to make the bend on at 17th and Morton coming home from the Post Office. If it was cloudy, no problem we had that covered. The bells at St. Peter and Paul Catholic Church chimed on the hour every day. The church itself was planted on what is the highest part of town and the steeple made the house of God climb even higher so that the steeple and the flying saucer water tower on the other side of town were the two highest structures for miles around. The two had a long distance romance looking back at each other over the years separated by all us minions running around at their feet. You could be down at Stanton Lake fishing and hear the bells or even as far out of town as the airport east of town and close to the Muddy River where some of the best squirrel hunting was and still hear the bells signal the hour. One could rarely use the excuse once you learned to count that you didn’t know what time it was based on the sights and sounds around you. Playing outside under open windows, (because no one had air-conditioning,) another signal for food was the clink of plates and glasses being pulled from cupboards as moms prepared kitchen tables with the every day real china plates and stainless steel utensils. Styrofoam and plastic just don’t add the same notes to mealtime prep. Every day, except Sunday, the noon whistle would blow. Mounted on top of the library it sounded the official start of the lunch hour and the slowing down of much of the business activities of the town. I don’t remember anyone ever getting offended when a business closed for lunch and polite people would never think of jumping into a business five minutes before the noon whistle with expectation of being serviced. 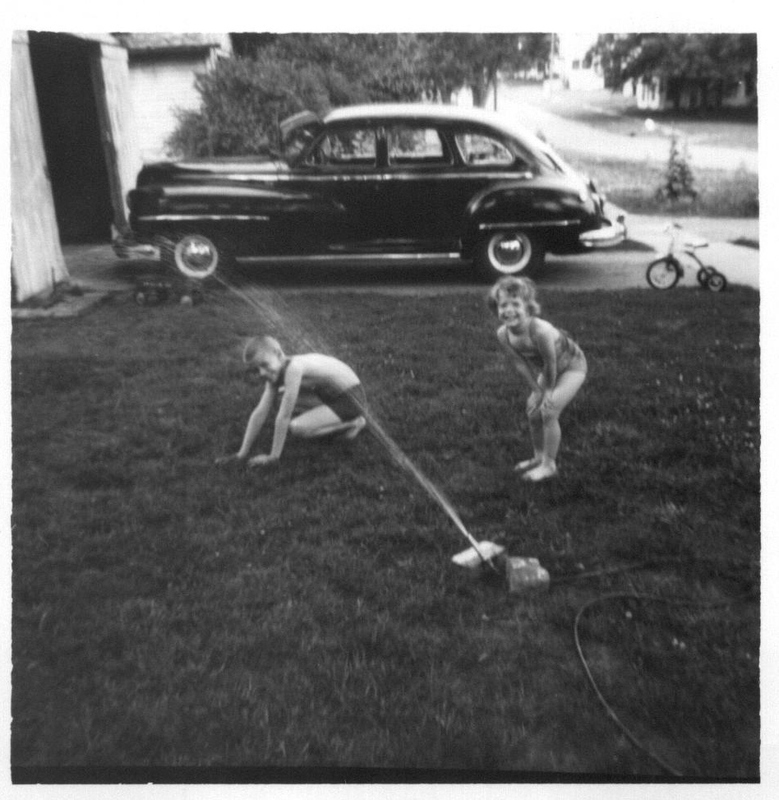 “When you here the noon whistle, (it was a siren but everyone called it a whistle) you make sure you come home for lunch,” was a common command by all the neighborhood moms. As the whistle was winding down sounding much like the air raid sirens of the World War II movies the Angelus bells of St. Peter and Paul would be ringing in all their glory trying desperately to call the faithful to a minute of prayer before they jumped in for a grilled ham and cheese sandwich and chocolate malt at the Chat-n-Nibble café across from the Courthouse. Those two noon day signals were also the starting gun for folks to tune in KTNC 12:30 on the AM dial to listen to the obituaries announced over the airwaves. This was pre-FM radio so the easiest signal to pick up was the local station. This meant every house and business you passed was on the same channel. Walking past open windows you heard the obituaries of some of the towns leading citizens. The list also provided fodder for conversation at the Dime Store lunch counter. The dearly departed were eulogized better there at the counter than at their funerals days later. This same station during Nebraska football season, would broadcast the Husker games to the shopping public by way of speakers mounted at different spots up and down Stone Street. The sound of football glory mixed with the grain trucks ratcheting through gears pulling away from the stop light by the Post Office and the Union Pacific blowing its horn as it passed through the rail yard at the south end of town made a fall melody no orchestra can duplicate. In the backyard red fox squirrels barking orders from the tops of old elm trees is another refrain that made up the orchestra of sounds. The squirrels yelled at the blue jays and the blue jays in turn screamed at the red birds perched on the feeder reminding them to leave some of the sunflower seeds for them. The turtle doves would observe it all sitting on the 220 power line and commenting on all the noise with their mournful “woe is me,” coo. Night sounds are special in a small town. The crickets would start shortly after sundown and were with you the rest of the night. The leg rubbing insects sounded like mischievous little kids swinging rusty door hinges back and forth, back and forth, just waiting for someone to tell them to stop. The nighthawks circling above collecting mosquitoes and other tasty bird treats blended their scratchy song to the evening chatter. Tree frogs contributed their two cents and if you were close enough to the city limits, you could easily pick up the cries of a coyote pack working their way across the field after a doomed rabbit. What you hear is a low hum or bump. You almost think your ears are ringing but you really do hear something. It is the slow movement of the tectonic plates under your feet. It is the shifting of the earth in subterranean Russia, South America or just down the street that makes its way through channels and vibrations to the very spot you are standing sending shock waves for your ears only. The sound I miss the most from growing up was carried out as nightly ritual on the back porch on summer nights. the Union Pacific train clicks on the rails and gives a last blow on the horn fades and is swallowed by the night symphony. All part of growing up is listening to the sounds around you and learning from them. It is worth repeating, the last day of school and Christmas were always the two happiest days of the year. They were followed close by birthdays and Fourth of July celebrations. Certain events of those special days pop up so clearly. I wonder why it is that some events or actions seem to stick and others fade away. The folk’s habit of taking pictures of so many events definitely helps to spark recollections but even a few of those photos are fading like the memories they detail. I can recall the yellow Tonka dump truck I received on my sixth birthday and it being so warm that November day I could play with it in the tractor tire sandbox. I also remember the day dad and I rolled the tractor tire home from the OK Tire Shop and the thing almost getting away from us coming down Seventeenth Street. The last days of school have their own set of memories for me. Our tradition for a couple of years were strawberry milkshakes at the drugstore up the street from Browns shoe store. The drill of the milkshake machine would drown out conversation until the metal cylinders were brought to the table, each one of them in a cold sweat. Pink brain freeze sucked through paper straws was the official start of summer vacation. The squishy squeaks of the imitation green leather booths and chrome trimmed tables and mom pulling extra napkins from the dispenser as fast as they would pop out making sure we didn’t “leave a mess” are pictures that aren’t waning. Over the years even the last days of school seem to run together. When you think you only have twelve of them to remember, you would think a person could do a better of job with the details. I can tell you, with clear recollection, my last day of high school. It wasn’t for any prank I pulled or remarks I made to the administration. Although I did miss a golden opportunity to leave a mark. If you recall from previous stories I was at this stage, signed and sealed to go to the seminary in the fall. So, in retrospect, I probably could have gotten away with just about anything and the nuns would have overlooked it. I can say that safely now because everyone that taught me at this stage is dead. They can give their response at a later date. On the last day of senior high I came home for lunch which was my usual routine. We had a half hour for lunch and in that time I was able to make it home, eat a sandwich or whatever mom might have ready, have dessert, which one could never miss, read the cartoon Pogo in the Lincoln Star (which was the only reason we subscribed to the paper) and make it back to school before the bell. As much as I hated school, I enjoyed the walks back and forth up and down Eighteenth Street. I could probably still do it with my eyes closed. It is what I received on this last day which made the day different and I have carried that day with me almost every day since. Lifting the lid revealed a Senior Old Timer pocket knife nestled in a form fitted piece of black foam. The knife’s side handles were made from stag horn and secured with three rivets on each side. It sprouted three open reflective steel blades, each still a virgin to the work expected out of pocket knife. And I have every day since. Pocket knives were important to dad, and I am going to say even to Grandma Casey. Maybe that’s where the habit of always carrying a knife started. The first knife I ever received was from Grandma Casey as a Christmas present when I was nine. The knife was double wrapped. On the outside was Grandma’s thick wrapping paper, the kind that you saved and could easily be used again, and the second layer was a note, “This belonged to grandma, I thought you might like to have it.” It wasn’t a particularly masculine knife. The handle was decorated with glitter imbedded red, green and yellow stripes but the blades were as sharp and mirrored as any blade found on a Tenderfoot Scout’s new Boy Scout knife. I carried that knife in my pocket until I joined scouts and bought my first of many scout knives with grass cutting money. In an effort of full disclosure, I don’t have perfect recall of such things as Grandma’s knife…I still have the knife wrapped in the note tucked safely away. I never knew dad to be without a pocket knife. Every birthday and Christmas morning, dad would produce a knife to slice the ribbons that Santa tied so tight or cut the tape that Santa also seemed so fond of using. When we were out for picnics it was dad’s pocket knife that sharpened the sticks for hotdogs or s’mores. When dad opened envelopes, I never knew him to use a letter opener, out came the pocket knife to slice a clean edge. When dad passed there were enough pocket knives in his drawer to pass around to grandkids, Teresa and Mary. I should have put one in the coffin with him, but I missed that opportunity. I am sure today, walking around heaven, he has reached into pocket looking for a knife only to be frustrated not finding one. Please tell me they allow knives in Heaven. I went back to school that last day with a knife in my pocket. Something today that would most likely have me thrown in jail, be labeled a threat to the community and my life ruined. I am also confident if there was a shakedown of my class that day, you would probably find most of the guys with a knife in their pocket. That’s just how life was. The Old Timer and I have been through a lot since that day. We been separated a few times by neglect or carelessness but we always found our way back to each other. Today, the knife blades are tarnished but they still get sharpened on a regular basis. The horn handles are a worn a little smoother from in and out of the pocket but it has aged well. My Old Timer has sliced open birthday cards, gifts that were taped with more tape needed and on occasion even a few pieces of meat when the flimsy plastic knife of carry-outs failed. Old Timer has tightened screws, scraped paint, cut ties to hold up tomato plants, dug deep to remove splinters from the palm of my hand, gutted a few squirrels and catfish and has been on every successful or unsuccessful trip into the woods. The trusted partner has also cut the tip off every cigar I have had since 1973. And, the Old Timer was with me on the motorcycle trip from Philly to Connellsville and it was with me every day I worked on staff at our Boy Scout Camp. The last thing the Old Timer and I did with dad that I cherish was sitting on the back porch smoking our pipes. Dad would pull out a different model of the Old Timer, pop open the blade and scrape the carbon from the inside of pipe bowl with the precision of a master carver. He clicked the blade back to its base with a firm metallic snap. I performed the same action with mine, sliding the longest blade around the inside of the bowl and then clicking the pipe against the ashtray that always sat on the porch table. We would both load our pipes, dad tamping his down with a practiced finger, me, I used the solid end of the Old Timer to tamp mine down. We sat on the porch like two Arab sheiks puffing on their hookahs watching the slow passage of the world up and down Eighteenth Street and the squirrels performing their high wire act on the 220 power line. Then the porch was quiet. Blue jays would holler or a turtle dove would sound a mournful coo to break the silence as smoke from two stokers would weave out through the screened porch. When I pass, (and I am putting it out there now to whomever is responsible for me,) slip my Old Timer in the coffin with me so that I can take it to dad on my last day on earth so we can celebrate the way we did, the last day of school. All part of growing up is, always having a good knife in your pocket. Black Beauty was not only a Horse! Cars have lost much of the character they once had. Long gone are the heavy real metal bumpers that could push another automobile out of a ditch and never sustain a scratch or dent. You don’t see moon hubcaps that could reflect your image like your own personal funhouse of mirrors or trunks big enough to stuff a body into, (not that anyone ever did.) How about the steering wheels, many were as big as the wheels they commanded. Cars are no longer described using words such as, “a buoyant restful ride; or, a gentle easy-going boulevard ride.” Those words just inspire the image of a big Packard rolling down Main Street on a Saturday night. Gone are the little side windows you could pop out to funnel just the right amount of air to keep you cool without blowing you apart or impaling you with passing grasshoppers. And, you will never again find the most convenient feature of all, the headlight dimmer mounted just to the left of the driver’s foot. What genius took that away? Today’s automobiles spend more time thinking for us and protecting us than they do transporting us from one place to another. Cars can email us, they can give us updates on their condition and we are getting very close to self-driving cars. Almost every car today can tell you if someone is beside you, behind you and if you are too close to the car in front of you, it will stop you. I am waiting for the day when in the middle of a July downpour it pumps its own gas so the driver stays dry or after hitting a Pennsylvania pothole, it drops a new tire to replace the flat that is whopping along like a deflated basketball. Cars of the present have short lives and are often replaced with ones bigger, better and faster after a few years of ownership. They rarely stick around long enough to become part of a family history. I can’t tell you the exact date when Black Beauty came into the family but I can tell you about the day. I was uptown, probably at the movies or library with either Tom or Mary and walking down 18th street I could see a strange car parked in front of the garage. We didn’t call that area a driveway because there was never a car parked in it until this day. But on this day, in the driveway sat a black, long nosed beauty. She had moon hubcaps which were framed by two inch wide white walls and a glass, naked lady that flew in the face of the wind as a hood ornament befitting the figureheads of the finest sailing ships of old. If you are a follower of these stories you have already met Black Beauty several times. It was Black Beauty that drove me to the hospital the snowy morning after a birthday to have my tonsils removed. It was Black Beauty that dad would park in a prime spot uptown and then we would join her later in the evening to “people watch” and eat popcorn from the Rivoli Theater. It was Black Beauty that made an attempt at a career as a tree trimmer. After one rough Nebraska windstorm, the Dutch elm tree on the front terrace shed a limb that was hanging precariously over the street just waiting to drop on an unfortunate driver. Dad thought it was his civic duty to remove the impending danger. Where Dad found the rope to start this operation is still a mystery to me. The rope was as thick as my young arm and long enough for him to somehow get it up in the tree, over the dangling limb and back down to earth. The next step was to tie the rope to Black Beauty’s rear bumper. A bumper that was definitely strong enough to tackle a little ole limb. She ran out of rope. The limb, which we now know was not totally broken off, pulled back like a deep sea fisherman hooking the fish of a lifetime. Black Beauty lifted her rear wheels off the ground and dangled on her front two for a split second. And then, with a few more like bounces the battle was over. The limb held its position with a taught line waiting for the fish to be cut free. Black Beauty if she could talk probably would have the same stunned reaction that dad did stepping out. Tom and Dad both looked at the situation like guys do thinking that a careful and intent stare will magically yield and answer. Then one of them came up with the solution, simply cut her free. When the rope was cut, which was now under enough tension we could have used it as a Middle Ages catapult to launch stones to the other side of the neighborhood, Black Beauty immediately settled all of her weight back to the street and tree took back what belonged to it. The rope and limb both stayed up in the tree until years later when the tree finally died of Dutch elm disease. Black Beauty never volunteered for hazardous duty again. Black Beauty became a mobile command center for Tom’s Ham Radio hobby. Dad fashioned a sign to the license plate with Tom’s call letters WA0DFX. For a while she sported a long white whip antenna mounted to the bumper. Tom served as the emergency coordinator for the Amateur Radio Club. For that job, Black Beauty was ready to spring into action when called on. Tom learned to drive with Black Beauty. Tom was never a tall man and in his early driving years he sat on multiple cushions to see over the long nose and utilized built up pedals to reach the brake and gas. Black Beauty was not above playing a few practical jokes and some of them were at Tom’s expense. One night Tom and I were returning from probably a Stanton’s Lake run or maybe to drop something off at one of his radio buddies when she decided to test his loyalty and honesty. As a good law abiding driver Tom signaled for a right turn coming up. I can remember it as a right turn because we were heading east on 21st street just passing the One Stop Café and turning onto Stone Street. When the turn was complete, the turn signal failed to stop blinking. We were approaching the next intersection with a blinking right turn signal. Tom felt obligated to make the turn since that was what Black Beauty was signaling. Now, Tom was not one to get flustered except when it came to potentially breaking the law. Tom was always a “by the book” man. We have now made one planned right turn and one obligated right turn. We are coming up on the next intersection with the blinker still going, we made another right, and again, and again, and again. Finally, breaking all rules, and I am sure after he checked every mirror for the local constables, stuck out his left hand to manually signal a left hand turn to get us home. I never remember Black Beauty having an owner’s manual. If there was a manual, it would have had no problem finding room in the bucket size glove box next to a coffee thermos, peanut butter sandwich, pliers, first-aid kit, sewing kit, flashlight, extra batteries for the flashlight, gloves worn for putting on the chains in winter, a bottle of Pepto Bismal, and Blackjack chewing gum. Black Beauty was our family ride until she was replaced with a 1960 something Dodge Dart with push button drive and this new advantage called air-conditioning. The dart never had a name other than the car or the dart. The dart was the car I learned to drive and it was also the car I managed to get royally stuck on a muddy country road, but that will be another story. When Black Beauty was traded in for the dart, she made her rounds with several people in town but was eventually put out to pasture. I mean she was parked in a pasture just at the edge of town within sight of the fly saucer water tower of Falls City. For a number of years I watched the weeds grow up around her and secretly wanted to rescue her when I was old enough. She sat there staring back into to town, the sticker I placed on the back side window from Mary’s Navy days was slowly faded by the Nebraska sun and her tires all lost pressure like an elderly person finally surrendering to gravity. One day Black Beauty was no longer there. Sometimes I imagine when I see an old Desoto at car shows that… maybe Black Beauty donated some of her parts so that others could ride on. But I do know that not only people, pets and places come in and out of our lives, but also machines that make our lives easier and they share in some of the same family memories that add to…all part of growing up.